Welcome to Day 2 of #ChristmasCookies week hosted by Ellen at Family Around the Table where we bring you every imaginable tasty sweet treat to get you ready for the Christmas cookie baking season! The one I'm sharing with you today is a definite keeper. I totally fell in love with these cookies. My thighs do not thank me. They are really easy to assemble, absolutely beautiful to look at, and the taste and texture are fantastic. They have that light flavor of almond, with a perfectly tender shortbread, full of sweet jam with a touch of "extra" from the glaze. 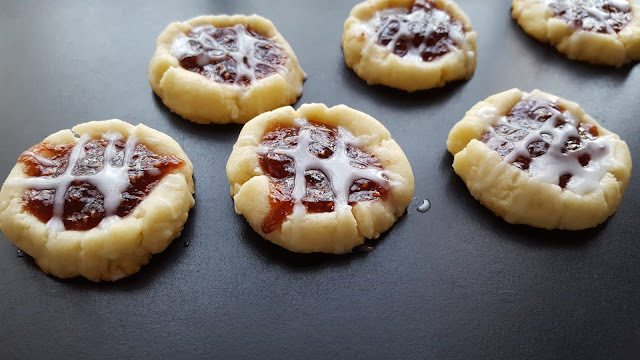 This is my new favorite cookie recipe! 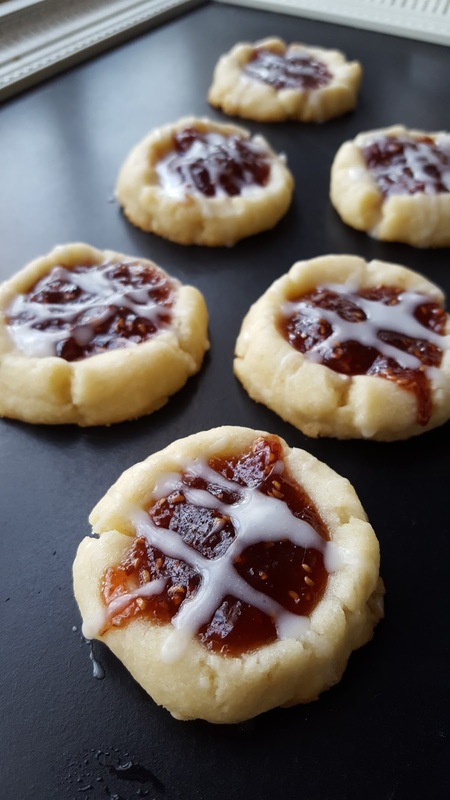 Come join me in drooling over all these amazing cookie recipes! Combine flour and salt in a small bowl, whisk to combine and set aside. Put the cold butter in the bowl of a stand mixer fitted with the paddle attachment and blend on medium speed for about a minute, then add the sugar. Blend medium to medium-high speed for another couple minutes until creamy, scraping down sides as needed. Add in the flour mixture and blend on low speed, scraping down the sides as needed, until combined. Allow to blend at least a couple minutes, mixture will appear coarse and crumb like. Use your hand to press the crumbs together to form a dough ball and refrigerate at least 30 minutes. Preheat oven to 350 degrees. Roll mixture into about 15-18 balls. Quickly press out the indentations in the centers using your thumb / forefingers. Fill with about 1/4-1/2 tsp of the jam per well. Bake immediately in the preheated oven 14-16 minutes, or until just golden brown along the bottom edges. Allow to cool on the baking sheet 3 minutes, before removing to a wire rack to complete the cooling process. 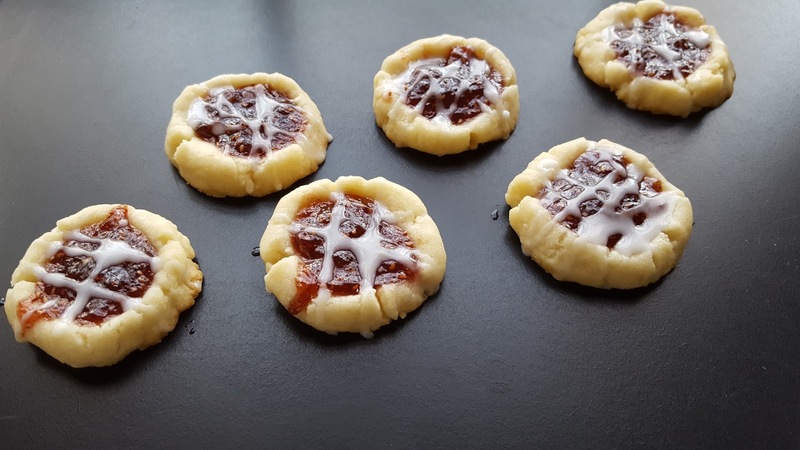 When fully cooled, combine the glaze ingredients in a small Ziploc bag, until just a squeezable consistency (too wet and the glaze will run / won't hold a pattern). Press the mixture around until well and evenly combined, and glaze is smooth. Snip just the very tip of the bottom edge of the bag off and use this to pipe a pattern of glaze over the top of the cookies, to your preference. Nielsen-Massey is sponsoring Christmas Cookies Week through this giveaway - make sure to enter!! These sound wonderful Rebekah. Wishing you and yours a perfect Christmas. Oooh. When someone says "new favorite," it piques my attention. Can't wait to try these.